Single-bay repair shops, quick-lubes, and high-volume tire shops require all the necessary tools to maneuver vehicles quickly and efficiently. Tire carts and dollies are some of the most dependable equipment an automotive professional can invest in. 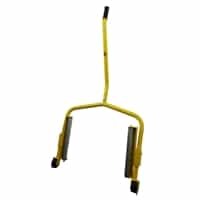 These carts and dollies can stow a variety of tires and are great to have on hand for replacing damaged or worn tires. Such a simple investment can also increase shop efficiency while eliminating the need to lift heavy tires. Our selection of tire dollies includes premium products by the best brands in the automotive market, including ESCO, Champion Concepts, JohnDow Industries, ATD Tools, and so much more. Are there tire stacks in your garage or service bay? Stacked tires can look crooked and unprofessional, but they can also leave unsightly stains on the floor. Chariot Concepts changes all that with the TruStack tire dolly. With this dolly, you benefit from a mobile unit of tires that you can easily roll out, roll in, and redeploy tire displays. Tire dollies made by JohnDow Industries are designed to make moving tires throughout the service bay simple, fast, and safe. The Tire Taxi™ is equipped with four heavy-duty casters and can to move up to eight tires or five tire and wheel assemblies. If you require a more ergonomic working height, look no further than the extended Tire Taxi™ model with four legs. Our selection of tire carts encompasses a wide range of capacities, from 265 to 1,500 pounds. OTC’s Easy Lever™ dollies feature a bent arm design to improve leverage and minimize back strain while transporting heavy tires. Super Wheel Dolly series made by ESCO will save your technicians from having to lift heavy truck tires. All dollies feature smooth rollers for accurate positioning and 360 degrees of access in any direction. Three-quarter-ton tire dollies may be the best solution for fleet maintenance centers that service large commercial vehicles. The tire carts in our selection will allow you to remove, transport, and replace dual wheel and tire assemblies without strain or struggle. 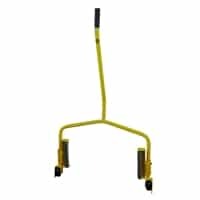 Best of all, heavy-duty hydraulic systems are actuated to provide smooth control for the removal and installation of single, tandem, and duplex tires or wheels. We offer free shipping and interest-free financing on select products. If you have any questions about our selection, please contact Best Buy Auto Equipment today.